Sports authorities in Kenya have announced a wide range of anti-doping measures, after a number of prominent Kenyan athletes failed drugs tests. Governing body Athletics Kenya will conduct more doping tests, including out of competition checks. President Isaiah Kiplagat told the BBC agents and coaches could be banned for life and face criminal prosecution should their athletes fail tests. At least 38 Kenyan athletes are believed to have failed drug tests. 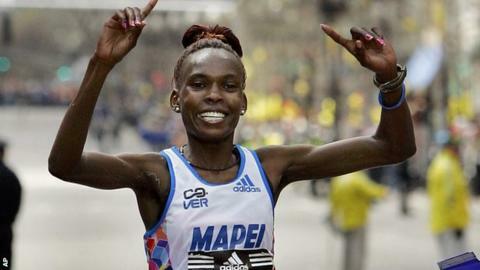 The new rules have been released ahead of three-time Boston Marathon champion Rita Jeptoo's appearance before an Athletics Kenya Doping commission. Jeptoo, 33, failed an out of competition test in September and is among a dozen Kenyan athletes under investigation for doping. Her case will be heard in Nairobi on Thursday. Kiplagat said moving forward, no athlete would be allowed to compete in any event without proper registration with the federation. "If an athlete is found culpable, they will be banned in accordance with the new rules - which extend to four years," he said. "Agents will also be removed and they must be sanctioned. "In fact for agents it's easier, because if you're the one who injected or found to have been contributing towards persuading the athletes to take banned substances, that's a criminal offence. "While athletes can be banned for four years, agents can go to jail." Elite athletes will also be issued with biological passports to test their blood and urine samples monthly. Agents, managers and coaches will also be required to register with Athletics Kenya and provide a list of all athletes they manage or coach.